Nancy was born in 1930 in the City of Prahran, not far from where her maternal grandparents lived in Caulfield. Her mother, Lizzie Bidstrup, was 42 years old and her father Ernest 43. Nancy was the third child and only daughter. 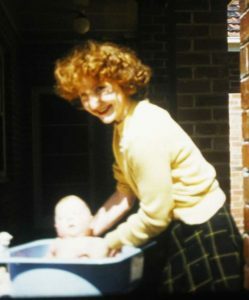 Nancy grew up on the farm at ‘Annadale’, undertaking her schooling at the Sugarloaf Creek School. Like her brothers, George and Alan, she participated in farm life, including riding horses. Her senior years of schooling were at Firbank Girls Grammar School in Brighton. Towards the end of WW2 she tragically lost her oldest brother George, a flight officer with the RAAF, to a plane crash in the Barrington Tops. After finishing schooling Nancy returned home, assisting her mother. She would travel with her father and mother, including visits to her Uncle Walter and cousins in Queensland. It would have been quite an undertaking considering the likely state of the roads in the late 40’s post war and the 1950’s. They would also make an annual event to go to the Royal Melbourne Show, often staying at St Kilda or with Uncle Finn and Auntie Fanny in Ascot Vale. Cousin Frances, Uncle Finn’s daughter was a frequent visitor to ‘Annadale’. Nancy had a nasty fall from a horse at one stage and badly fractured her left elbow, an injury that bothered her until her death. By the late 50’s her mother’s health had become quite bad, suffering from severe arthritis and asthma, and Narycy nursed her mother at home until Lizzie’s passing away in 1961. 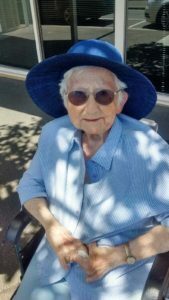 During the 1960’s through to the early 80’s Nancy took care of her father Ernest and held the fort while he went to innumerable meetings (many years president of the Broadford and Pyalong Shire councils, member of the water works trust in Seymour etc). She was a great maker of plum-puddings and yoyo biscuits, and knitted jumpers and other things for her nephews. Her outside interests included photography and travelling. She travelled around parts of Australia and also overseas to Fiji. Nancy was quite active with the local CFA, supporting the crews by manning the radio etc. She was also a member of the St John’s Ambulance and donned the uniform many times. During the early 1980’s , due to his failing mobility, Nancy’s father Ernie had to move in with her brother Alan and sister-in-law, Esme’. Nancy was no longer able to manage him, having considerable back pain which required a back operation (she had a laminectomy in 1983). Ernie sadly passed away in 1985. Nancy inherited ‘Barrington’, their home at Broadford, and a significant portion of “Annadale” from her father. Wantjng a new start, she sold Barrington and her stake in Annadale and moved to Geelong where she bought a house in Mt Pleasant Rd, Belmont. It was to be her home til her passing in 2017. In Geelong Nancy connected with some of her old friends and her cousin Edna Pritchard (nee Bidstrup). She also joined the Highton Anglican Church and became one of their community. In the 90’s she took some sewing classes in Geelong. 12/05/2015 Hip Pain – Left. Osteoarthritis of many joints including left hip and both shoulders and elbow. Rheumatoid arthritis of hands and feet. 11/05/2010 Chronic Renal Failure .
? 2010 Fusion of right ankle. As a child Measles, left elbow fracture. While in Geelong Nancy went on many trips around Australia and also visited New Zealand. She made extensive photo albums of her travels. 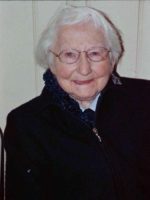 It was a great disappointment to her later in life that her mobility became so poor that she was unable to travel anymore. To her that was the end of her worthwhile life. The last few years have not been kind to Nancy. Sadly she was not good at making the best of her bad situation. Nancy stayed at home way past when she would have had a better life in a nursing home. For the last three years she has very vocally expressed her wish to pass to the next life. On Friday 30th June 2017, after fracturing her left hip 9 days before, she was finally granted that wish. May she rest in peace.